There are things that I would have added to a life list if I had been aware that I would experience them. I would have wanted to be deeply connected to another human being, to have the privilege of being there at the end of his life, though I had never aspired to doing either of those before they happened. I would have chosen to experience for a brief time such disparate places as a mesa in the high plains of Colorado, the edge of the north woods of Wisconsin, the high desert of California, but again, those are not things I would ever have added to any list since I’m not easily uprooted. I would have also wanted to reconnect with my best friend from high school, and now I’ve done that. (The visit was wonderful, by the way, and wonderfully strange considering all the years that have passed since I last saw her.) Besides, now that I’ve done these things, I would have crossed them off any list anyway, and the list would still be blank. A couple of times I tried to do the creativity stimulation exercises in Julia Cameron’s The Artist’s Way, and I generally stuck with the morning pages (three pages every morning to write whatever came to mind) and the artist’s date (a weekly date with yourself) but always, when I got to the part about making lists, the excercises screamed to a halt. There are various exercises in the book involving lists: What would I try if it weren’t too crazy? What would I do if it weren’t too selfish? What five things would I never personally do that sound like fun? What do I wish for? I’d like to be able to make a living with my books, of course, but other than that, no wish comes to mind. I’ve never had any desire to go to Paris or London, never had any desire to travel to exotic locales to see ancient ruins, though I wouldn’t mind seeing such places if I could figure out a way of simply being there without having to make the long trip. 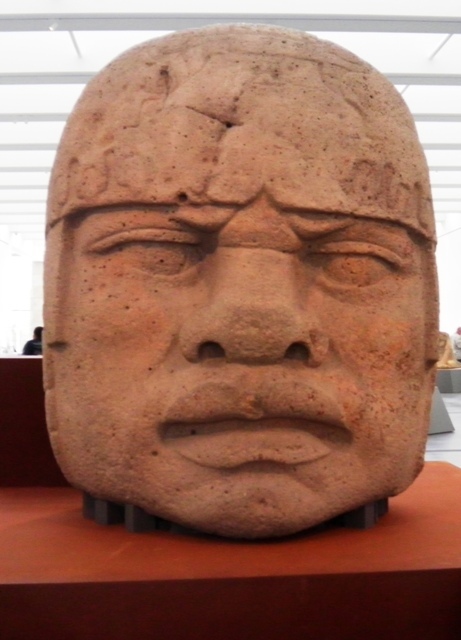 I did have a desire to see the Olmec heads, and one came visiting at a museum nearby, so I satisfied that desire. I’m not sure it’s possible for me to become a wisher. I used to want things, of course, but too often I didn’t get what I wanted, so I learned not to want. I know it’s important for a character to want something — it’s what makes them compelling. But is it important for us to want things? Or is it better for us to be more zen in our approach, to accept what comes our way? This is where I am now, stuck somewhere in the middle of those two questions. Maybe this could be my list? 1. Find something to wish for. 1. Make it as a popular writer. 3. Make lots of money legally. 4. Go overseas to various countries. 5. Go on a dig and possibly unearth something of historic value that has been hidden for centuries. 6. Get a home in the country near a river or near a beach where there are fish I can catch. 7. Stop developers from destroying my country. This includes coal seam gas mining. 8. Invest in art which might include the making of a movie or television show. 9. Start a business that helps artists and writers. 10. Do something for my sisters and their offspring that will improve their lives. That’s it. Yep! A lot of wishful thinking. Mind you I might trade historic dig for a local pre-historic dig. Some unusual finds have been made in South Australia over the last few years, buried at a time when the country was a lot greener than it is now. What a wonderful wish list! If I had one wish, I’d wish your wishes all came true. My bucket list is about as long as yours. Nice to know I’m not the only one. I was beginning to think there was something wrong with me for not having a list of things I want to do. I don’t know if I’ll ever have a list of things I want to do. Losing the one person who means more to you than any other shows us that our wishes don’t mean anything — life does what it wants regardless — so there’s no real point in indulging in wishful thinking. That’s a pretty good wish list to have. « For Now . . . Just Write.